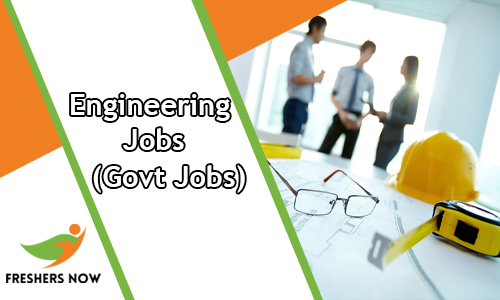 Engineering Govt Jobs 2019: Those who had successfully completed their graduation in engineering are anxiously looking for the latest Engineer Jobs in a Government sector. It is the exact time for the candidates those we are looking for Government Jobs. All the candidates are advised to Apply Online For B.Tech Jobs from this page. In the below section we have given all the latest Engineering Govt Job Openings 2019 in a detailed manner. Both Freshers and Experienced candidates who had completed their Engineering can utilize the Engineering Government Jobs 2019 which we have given in this article. Just scroll down the current article and check out the current openings for B.tech people. The present Engineering Govt Jobs 2019 page is only for the people who are in search of Engineer Jobs 2019. In this page, all the job hunters can check the latest and newly released Recruitment Notifications for Engineering Jobs 2019. This complete page is dedicated to the job seekers who are looking for Government Jobs for Electronics and Communication Engineers, Govt Jobs for Computer Science Engineers, Government Jobs for Electrical Engineers in Railway Jobs 2019, Govt Jobs for Mechanical Engineers, Government Jobs for Civil Engineers, Govt Jobs for Electronics and Communication Engineers in Railway and also list of Government Jobs for Mechanical Engineers. Aspirants can check the latest Engineering Govt Jobs 2019 from this page. We are here to provide a bulky number of vacancies for the candidates those who had successfully completed their Engineering or B.Tech. Every year a huge number of engineering students are completing their Engineering. And all the people are looking to build their career in the Government sector. Also, many of the engineering candidates are interested in Bank Jobs 2019. Without delay check this page completely for the latest Engineering Jobs 2019 updates. Job fighters who had completed their B.Tech in different streams such as IT, CSE, EEE, ECE, Mechanical, Civil etc are eagerly waiting to apply for the B.Tech Jobs. As we all know that there is a vast number of job openings for Engineering Graduates in Government Jobs. Aspirants who had completed their studies can check all the Engineering Govt Jobs 2019 and apply for the jobs before the closing date through online mode. Every year a bulky number of students are graduating as Engineer in various streams as we mentioned the specializations in the above section. Many of the job vacancies are available in Engineering Industry. We suggest to both Freshers and Experienced job hunters can apply for the latest Engineering Job Openings 2019 after going through the complete details which we have given in this page. We strictly instruct the contenders that only Engineering People can use the current recruitments. Also, we insist to the aspirants that not to apply for the openings if they don’t have the eligibility criteria that are stated in the official Recruitment notification. Hence before submitting the application form, you have to refer all the mandatory details. At the above table, we are also giving the valuable information such as education qualification, information related to experience, age limit, age relaxation, selection procedure, salary details, application fee and also steps to apply for Engineering Govt Jobs 2019. So check all the details and apply only through online mode before the end date. Many of the authorities are inviting the applications for the candidates those who had completed their Engineering. BEL, BMRCL, WBPSC, MECON, NACL, NLC, WAPCOS, CSIR, NMRC, IIT Delhi, TSPSC, NFL, Coal India, DCIL, ISRO, Mizoram Forest Department, HSL, Haryana SSC, Assam University, Himachal Pradesh PSC,JSHB, APSPDCL, CG Vyapam, HSL, HPCL, EIL, BPCL, Mazagon Dock, NMDC, SAIL, Railtel, RITES, UCI, NTPC, IOCL, ONGC, PGCIL, etc want to recruit the talented people into their organization. There are various government sectors that are arranging the latest job opportunities for the Engineering students. Hence, check them out and apply for the suitable one as your percentage and experience wise that grabs your attention. We all know that there is an immense demand as well as competition for the Engineering Govt Jobs 2019. Without having proper preparation it is very difficult to crack the selection rounds. Generally, the organizations conducted written exam and interview rounds for selecting the capable people into their organization. After completion of applying the Online For B.Tech Jobs 2019, all the aspirants need to focus on the preparation. You can also get the materials from our website at free of cost. So check the material and work hard. Also, it is mandatory to clear all the rounds. Those who qualify for the written test are only eligible for the further rounds. Check the Project Assistant, Contract Engineer, Assistant Engineer and Assistant Executive Engineer, Junior Engineer (Civil, Mechanical & Electrical), Site Engineer, Project Engineer, Graduate Engineer, Graduate Apprentice, Technician Apprentice , Assistant Manager, Deputy General Manager , Scientist, Senior Scientific Assistant, LDC, Account Assistant, Junior Technical Assistant , Assistant Professor, Technical Staff, Chargeman II, PGT TGT PRT and much more vacancies. We all know that the competition for Engineering Govt Jobs 2019 is very high. The candidates can get an attractive salary package from the officials. Before applying you have to check the application fee. And there is a different application fee for each category. So choose according to your category wise and pay a fee.